L to R: Kyas Sherriff, Head of Indigenous, AFTRS; Grant Maling, AFTRS graduate; Marissa McDowell, AFTRS graduate; Angela Bates, AFTRS graduate; Rebekah Hatfield, AFTRS graduate; Shontell Ketchell, AFTRS graduate; Maggie Whitehouse, AFTRS graduate. Three years after AFTRS’ Indigenous Unit was established, the School has graduated twelve Indigenous students, a record number for the same year. They follow in the footsteps of previous graduates including Ivan Sen, Rachel Perkins, Dena Curtis & Warwick Thornton. 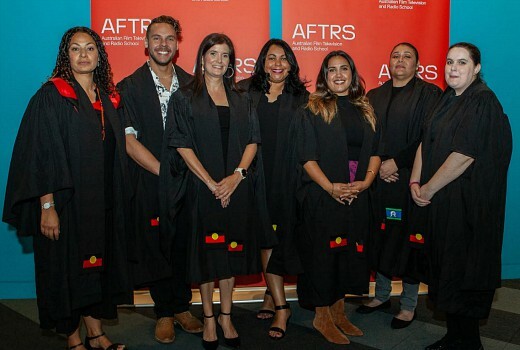 Six Indigenous students have graduated from AFTRS’ full-time degree courses. Alex Hancock and Timothy Miller have graduated from the Bachelor of Arts Screen: Production; Angela Bates and Marissa McDowell from the Master of Arts Screen: Business and Leadership; and Jerome Comisari and Grant Maling from the Graduate Diploma in Radio. Six Indigenous students also have graduated from discipline specific degree courses: Shontell Leah Ketchell graduated in Screenwriting; Micha Barlett in Directing; Joel Rasmussen in Cinematography; Maggie Whitehouse and Rebekah Hatfield in Documentary; and Irma Woods in Script Editing and Development. AFTRS’ Indigenous Unit was established in 2016. Its purpose is to find, develop and support talented Aboriginal and Torres Strait Islander students to study across the School and to create pathways for these students to enter the Australian screen and broadcast industry in every creative role so it better reflects the diversity of Australian society. Several of this year’s Indigenous graduates have already been given opportunities in the industry. Since studying the Master of Arts Screen: Business and Leadership, Angela Bates has become Development & Investment Manager of Screen Australia’s Indigenous Department; immediately following the Graduate Diploma in Radio Grant Maling received a six-week paid internship at Southern Cross Austereo, and following her documentary studies Maggie Whitehouse was a recipient of AIDC 2019 Leading Lights funding.